LBE is a eutectic mixture consisting of 45 percent lead and 55 percent bismuth. It is foreseen as a possible coolant for Generation IV nuclear reactor systems. The most interesting properties of LBE in comparison with lead and water are presented in Table 1. A principal advantage of LBE over lead is the low melting point of 125 °C, rather than lead's 327 °C. If the heat source in a nuclear system is shut down, then it is much easier to avoid freezing of the coolant. The kinematic viscosity is about 80 percent less than water, therefore most LBE flows (and also most other liquid metal flows) are turbulent. Furthermore, the boundary layers are very thin and require fine meshes, especially to accurately predict heat transfer. The heat conductivity of LBE is significantly larger in comparison with water, which makes heat transfer much faster and easier. In addition, the high boiling point reduces the probability of problematic two phase flow conditions in case of an accident. Table 1: Physical properties of LBE compared with lead and water. Figure 1: The configuration of the rod bundle model. This image was created using ANSYS CFX-Post. In the Karlsruhe Liquid Metal Laboratory (KALLA) at KIT, an LBE loop is operated allowing the testing of rod bundle configurations in a typical reactor geometry. The intention of those experiments is to investigate the heat transfer in rod bundle LBE flow and to quantify the influence of the spacers, which are necessary in reactor cores in order to fix the geometrical configuration and guarantee adequate cooling. 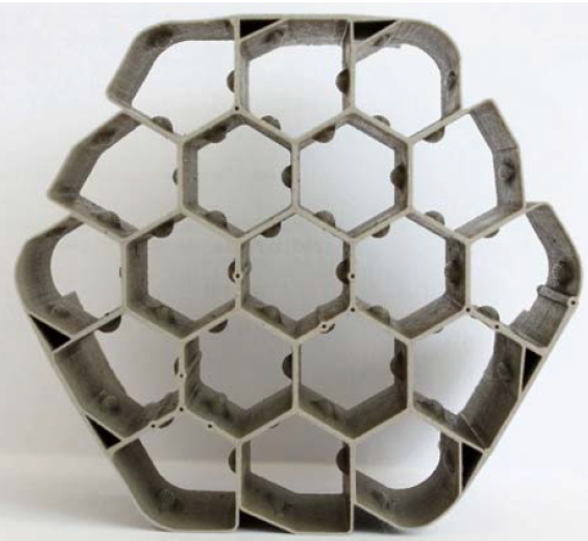 The tested bundle consists of 19 rods with a diameter of 8.2 mm and a pin distance (pitch) of 11.48 mm in hexagonal arrangement forming a part of a nuclear fuel assembly. The length of the bundle is about 1.3 m. The vertical rod bundle can be electrically heated with heat fluxes at a maximum of 106 W/m2. The experiments are performed at coolant temperatures from 190 °C to 450 °C and at average flow velocities up to 1.8 m/s, which means Reynolds numbers close to 80,000 are reached. For the test bundle, three spacers are installed. The spacers have a length of 25 mm with a variable wall thickness from 0.5 mm upstream to 1 mm at downstream location. The spacers hold each rod in place by 3 elliptically shaped elements at singular touching points. The bundle configuration of the numerical model is presented in Figure 1, whereas an individual spacer is shown in Figure 2. Because of symmetry conditions, only a 60° segment of the bundle is meshed. In vicinity of the touching points, large variations of the heat transfer conditions are expected. Therefore, the quality and the spatial resolution of the grid have significant influence on the accuracy of the simulations. In order to minimize the number of cells and also numerical diffusion, a full structured mesh consisting of 22 million cells was created. The difficulty for the meshing was to find an appropriate topology for a structured mesh while keeping the cell angles within a reasonable range. Figure 3 presents minimum cell angles at various axial positions inside the spacer. The lowest angles of about 15.6° are obtained inside a spacer bypass channel and at some parts of the fixing elements, as indicated by the red marks in the figure. 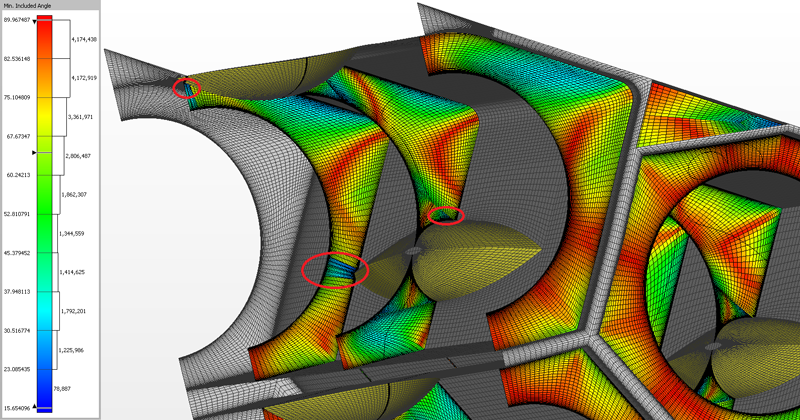 The most crucial points in terms of modeling were the spacers' touching points, where the local geometry had to be modified because of locally poor meshing conditions. Therefore the upper part of the fixing elements (0.01 mm) was cut off and the resulting gap enclosing an elliptical hole was closed with an adiabatic thin wall. As consequence of the block topology, the cell spacing at the closing gap is less than 10-3 mm, which leads to a y+ in the range of 0.01. Figure 3: Details of the mesh with cuts showing minimum cell angles. Standard turbulence models based on dissipation rate failed, as did the application of scalable wall functions. 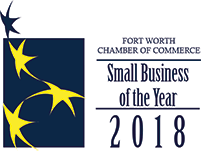 Consequently, the simulations were performed with an omega Reynolds stress model and automatic wall functions with low Re formula taking viscous sublayer resolution into account. which is assumed to be a constant close to 1. In this work, based on DNS/LES simulations on liquid metal flows in heated rectangular channels, the turbulent Prandtl number is considered as dependent on Re, y+ and Pr. Figure 4 presents the distribution of Prturb in central position of spacer 2. At the walls Prturb approaches values close to 3, while toward the center of the subchannels values of about 1.4 are reached. Away from the spacer at the center of the subchannels, Prturb decreases to values of 0.9, which is usually used as constant value for conventional fluids such as air and water. Figure 4: Cross section of the turbulent Prandtl number at Re=78,000. This image was created using ANSYS CFX-Post. 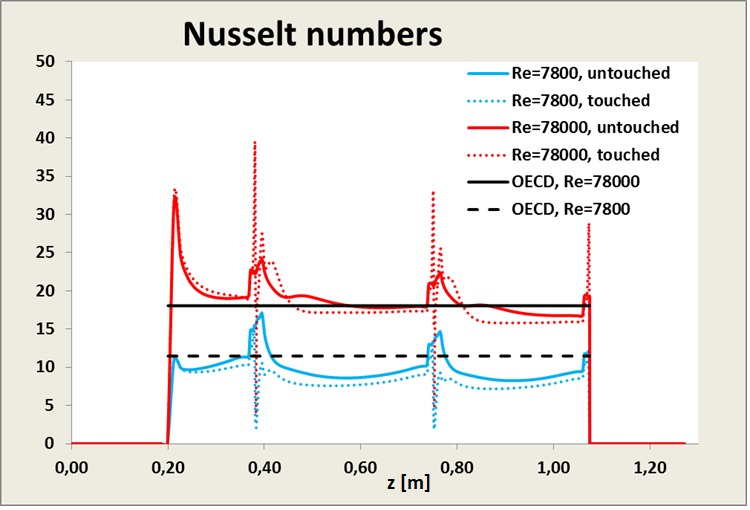 In Figure 5, a detailed analysis is presented of local Nusselt numbers along two straight lines in axial direction on the heaters surface, lines a and b in Figure 4. Line a is denoted as touched and passes through the center of the fixing elements, while line b (untouched) is located with a circumferential displacement of 60° towards a. The heating of the bundle starts at z = 0.20 m and ends at z = 1.08 m with a constant heat flux. The origin of z is located at the model inlet (see Figure 1). Figure 5: Local Nusselt numbers analysis. An analysis for two different Re numbers is presented, where Re=78,000 is reached at an average coolant velocity of 1.8 m/s. Higher velocities lead to corrosion problems, especially at the spacers made of steel. The local distributions are compared with a correlation taken from an OECD handbook for liquid metal rod bundle flows . At the beginning of the heating, the temperature differences between the heater rod surface and coolant are low; therefore Nu has a local maximum. Further downstream to the first spacer, the flow develops toward an equilibrium state and the predicted Nusselt numbers are rather close to the OECD correlation. 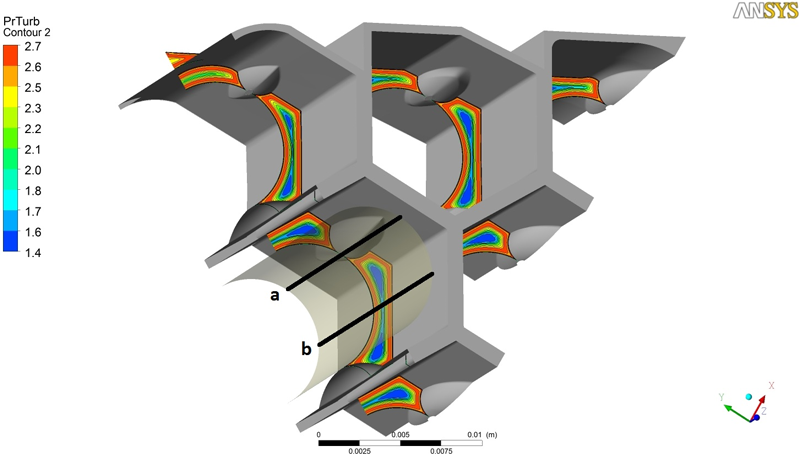 The spacers are blocking the cross section; therefore the average coolant velocities are increasing and the conditions for heat transfer are improved. So at the entrance of a spacer the Nusselt numbers are locally increasing by about 80 percent. Along the touching lines inside the spacers, the local heat transfer conditions are varying significantly because upstream of a touching point the heat transfer conditions are improving rapidly due to stagnation point conditions, while downstream of a touching point the flow separates and offers poor conditions in terms of local heat transfer. Therefore, strong local fluctuations for the Nusselt numbers are predicted near touching points. For Re =7,800 the turbulent heat transfer is significantly lower (against conduction); therefore the amplitude of the fluctuations is lower. Additionally for Re=7,800 we are in the transition region to laminar flow together with upcoming buoyancy effects, which are not yet included in the numerical model. So in the equilibrium regions upstream of the spacers the agreement with the OECD correlation is lower. On the other hand, for liquid metal flows, especially for heat transfer, there is a wide range of uncertainty for the experimental values from which correlations are derived. Therefore, the overall agreement between simulation and the OECD correlation for the entire Re range can be designated as good. The work was performed and supported in the framework of the EU project THINS – Thermal Hydraulics of Innovative Reactor Systems. HLMC handbook, OECD (2007), NEA No.6195.